I have been wanting to buy a set of cast iron fajita skillets for months, and finally did it this week. I am so excited, and have many ideas on what I can serve on them. I had a package of turkey cutlets in the refrigerator, so my first skillet dinner was this Sizzlin Turkey Cutlet Skillet with Sweet Chili Sauce. 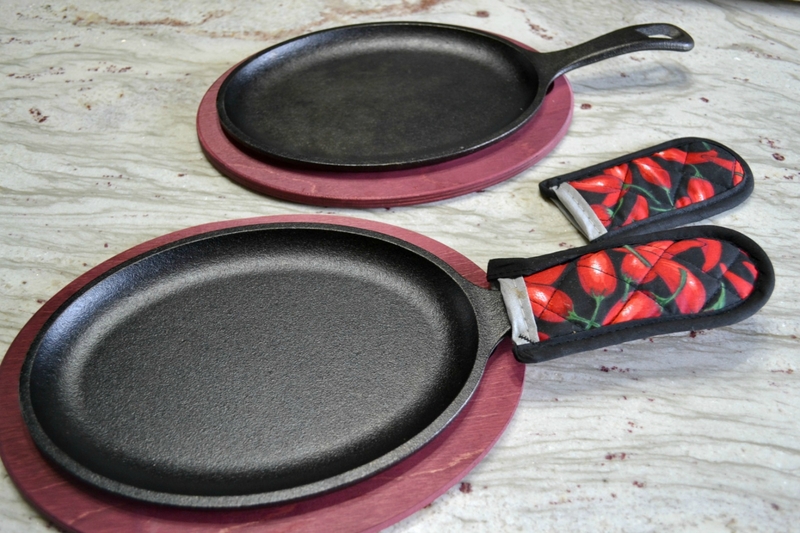 I found these cast iron fajita skillets at our Kitchen Store, but have also seen them on Amazon. They are made by Lodge. They came with a wooden under liner and a cute little hot pad that fits over the handle. Directions for care came with them. This dinner was easy to create. 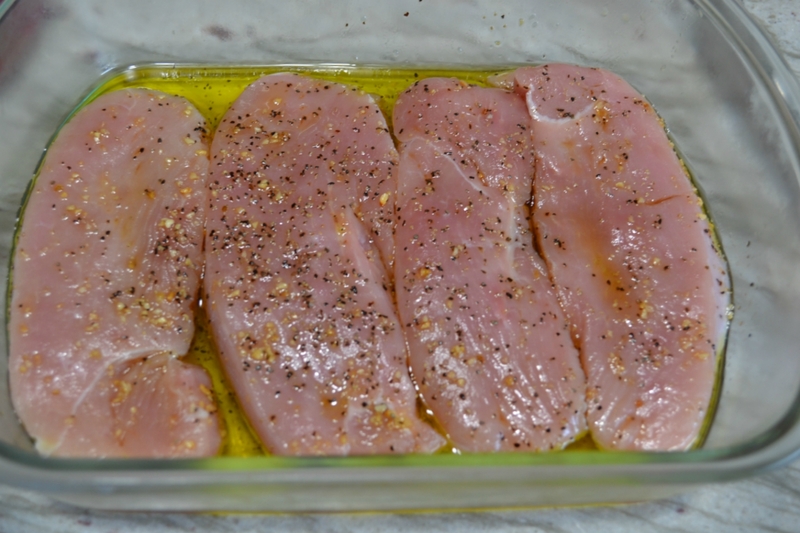 Arrange the turkey cutlets in a dish. Season with olive oil, garlic, salt and pepper. Wash and chop fresh vegetables. Use any veggies your family likes. Place veggies in bowl, season and drizzle with olive oil. Bake on large baking pan in 425 degree oven. Roast the potatoes about 20 minutes, then added the onions. The last 10 minutes of baking, I added the peppers, broccoli, and mushrooms. Stir vegetables occasionally. My husband doesn’t like roasted carrots so I did boil them, but you can roast all of the vegetables. Grill the turkey cutlets in grill pan or on grill. Place the skillets in the oven the last 12-15 minutes that the vegetables are cooking. They stayed warm through our entire dinner. To serve: Arrange the vegetables evenly between the skillets. 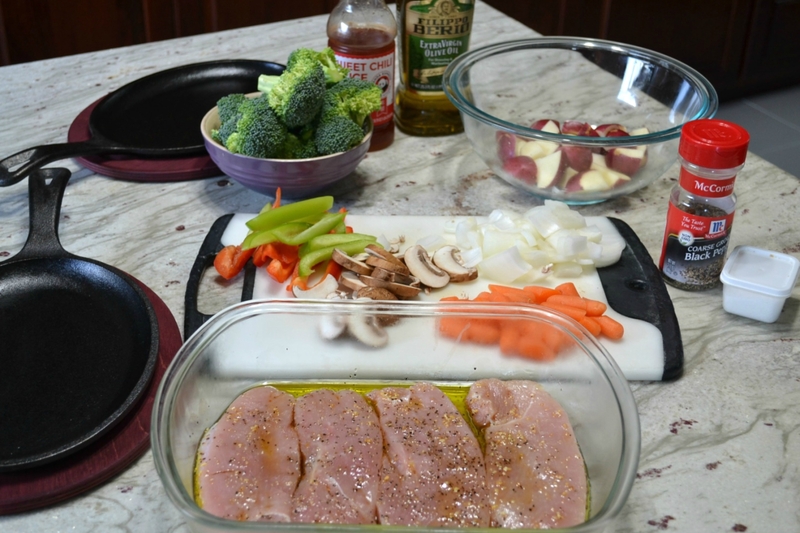 Slice turkey cutlets into small pieces and arrange on top of vegetables. Drizzle with desired amount of sweet chili sauce. 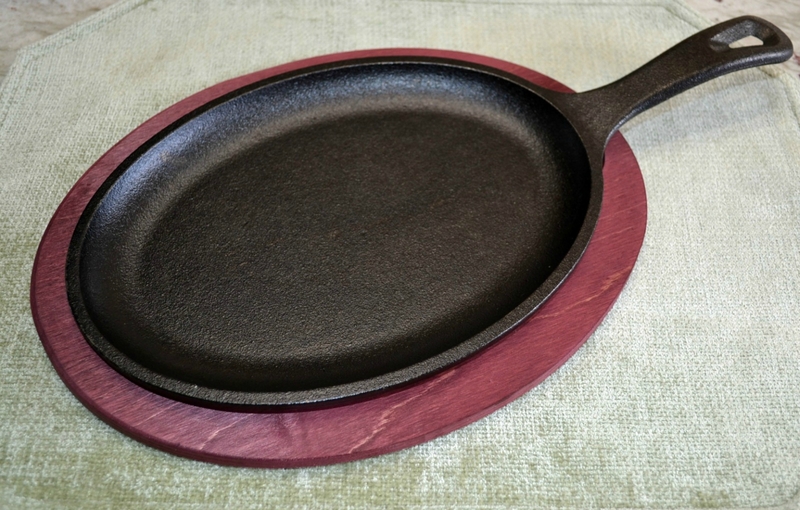 Serve skillets on the wooden under liners. 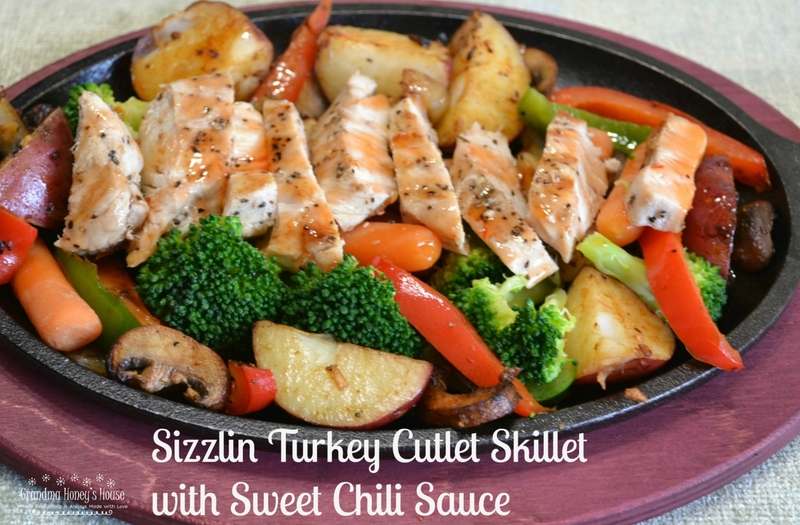 I will be sharing many more sizzling skillet meals in the next few weeks. I hope you will find some that you would like to try. Preheat oven to 425 degrees F. Place turkey cutlets in a dish. Season both sides with garlic, salt and pepper. Drizzle 1/4 cup of olive oil over the turkey. Turn the cutlets once. In a large mixing bowl, place the potatoes, carrots, onions, peppers, broccoli, and mushrooms. Season with salt, pepper, and onion mix. Pour remaining oil over the vegetables and toss to coat. 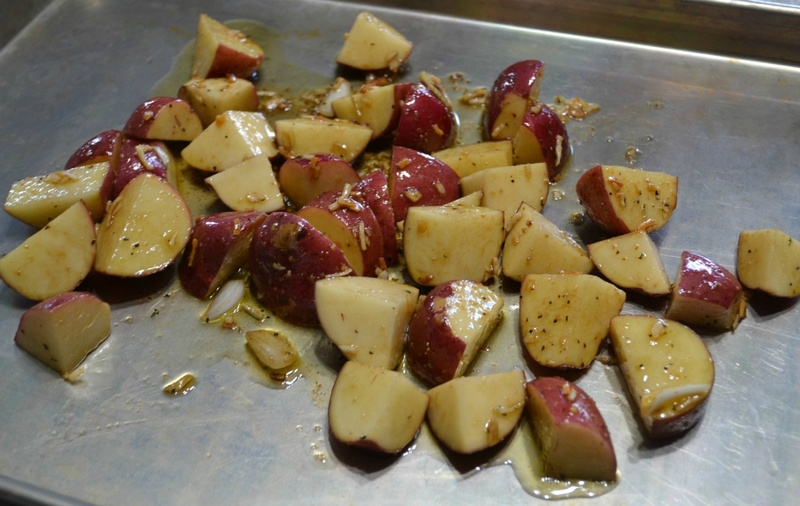 Spread onto a large baking sheet and place in the oven. Bake about 45 minutes.Turn occasionally as roasting. The last 25 minutes that potatoes are baking, spray a grill pan with non stick cooking spray and heat over a medium heat. 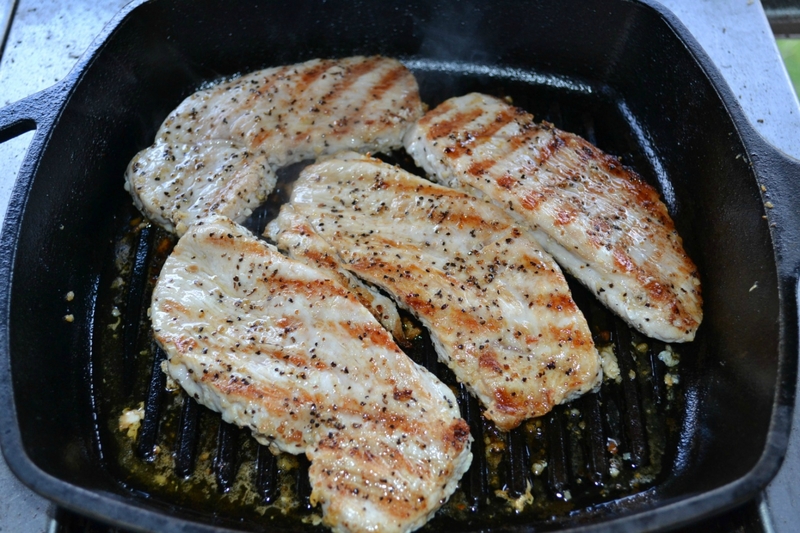 Arrange turkey cutlets in grill pan and cook about 10 minutes. Turn meat and continue cooking, about another 10 minutes. Temperature should be 165 degrees. Remove from grill pan to a plate. Allow to rest a few minutes and then slice into thin slices. The last 12-15 minutes of roasting vegetables, place 2 cast iron fajita skillets in the oven to heat. 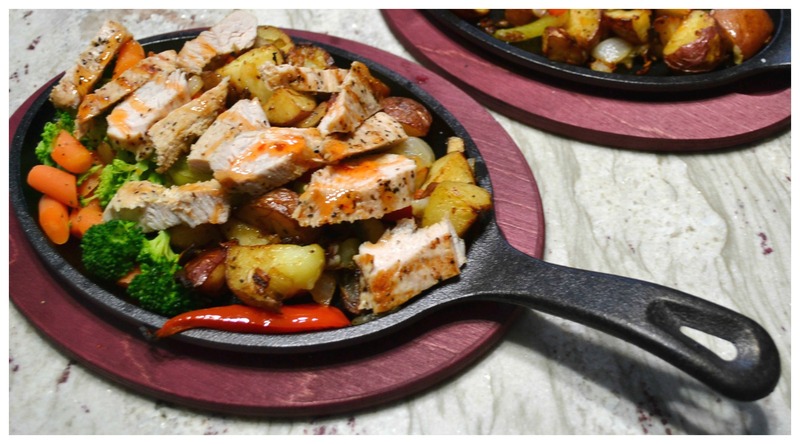 To serve the dinner, arrange the vegetables evenly between the 2 skillets. Top with slices of turkey. Drizzle desired amount of sweet chili sauce over the meat. What fun! I finally got my first cast iron skillet and a cast iron griddle that fits over 2 burners and I am having so much fun with them that I may just have to get those little fajita skillets! Dinner looks great! Sometimes I get crazy with new pans or skillets! LOL…I love new kitchen items. Congratulations on your cast iron skillet. I use mine a lot.